AUTHOR’S NOTE: Because I, David Chase Taylor, officially applied for political asylum in Switzerland on July 17, 2015, the state-sponsored terror plots and so-called “natural disasters” I expose rarely come to fruition. In short, the Swiss CIA does not want to afford me any more credibility or publicity than they have to, lest they turn me into a modern-day prophet. They also do not want to provide yet another open-and-shut case as to why I deserve political asylum. For those wondering why I would apply for political asylum in Switzerland, know this: a) I originally applied for asylum in Switzerland on March 8, 2011, roughly 2-years before I discovered that Switzerland was harboring the CIA; and b) the CIA has historically not shat where it eats in Switzerland. That being said, the CIA has now been exposed for the first time in history. Consequently, they are extremely desperate and may assassinate me Switzerland. SWITZERLAND, Zurich — Based on breaking news and events, it appears that CIA Headquarters beneath Lake Geneva is plotting a man-made asteroid attack. Although a major asteroid has not struck Earth since the Dinosaur Age, one is expected nonetheless this October 2015. Back on December 10, 2013, Truther.org published a terror alert in respect to a man-made asteroid attack from Comet ISON. Less than 24-hours later, Comet ISON was officially declared dead by NASA. Needless to say, in the aftermath of this report, the JADE HELM 15 man-made asteroid attack will also be declared dead. Although the Comet ISON attack by the CIA in Switzerland was ultimately thwarted, the plot to terrorize humanity with an artificial space rock is alive and well. Despite the fact that a major asteroid has not struck the planet since the dinosaur age, a Doomsday asteroid will strike Earth prior to President Obama leaving office on January 20, 2017. As evidenced herein, there have been more than 30 asteroids, comets, fireballs, meteoroids and meteorites which have entered Earth’s orbit within the last calendar year (see list below). Needless to say, the unprecedented amount of space rock-related activity suggests that a man-made asteroid attack is imminent. Exactly when the asteroid will strike is not known, but September 2015 appears to be the chosen time. Interestingly, despite the incessant rumors (see below), a specific asteroid has not been named by NASA for the September attack. This appears to be a premediated decision in order to prevent Truther.org from exposing the asteroid as being man-made in nature (see previous reports). In what appears to be pre-Fall 2015 asteroid attack propaganda, the BBC published a report back on August 20, 2015, entitled “NASA: Asteroid Capable of Wiping out US Won’t Hit Us on 15 September, Probably”. The term “probably” confirms that an asteroid strike is now in play for September of 2015. A day later on August 21, 2015, Forbes magazine published a report entitled “NASA Assures An Asteroid Will Not Kill Us All Next Month”. The fact that NASA addressed the September asteroid rumor confirms, albeit in a de facto manner, that a September asteroid strike is in play. Three days later on August 24, 2015, the Times of Israel published a report entitled “Mock Trial in Israel to Debate Who Pays When Asteroid Hits”. Needless to say, the mock asteroid trial is designed to raise the notion of an asteroid strike on an international level just prior to its fruition in reality. In what appears to be a beta-test of the actual man-made asteroid, it was reported on July 31, 2015, that a fireball turned the sky green over Argentina (see video below). The so-called fireball witnessed had all the earmarks of a man-made asteroid, namely the brightness, color and speed, not to mention that it was predictably never identified by NASA or the ESA. Roughly a month later on September 7, 2015, another mysterious fireball lit up the sky over Bangkok, Thailand. Again, the so-called fireball had all the earmarks of a man-made asteroid, namely the brightness, color and speed, not to mention that it was predictably never identified by NASA or the ESA. Roughly a month later on October 1, 2015, the Sun published a report entitled “Plan to Save the World from Armageddon: Space Mission will Deflect Asteroid in Practice to Avoid Doomsday Destruction”, raising the specter of an asteroid strike just prior to its fruition in reality. If and when a Doomsday asteroid strikes planet Earth, it will most likely land in the Gulf of Mexico or the Pacific Ocean and the so-called Ring of Fire, causing massive man-made earthquakes, tsunamis and volcanoes around the globe. The man-made asteroid would never strike land because there it could be located, examined and tested by scientists for its authenticity. This obviously cannot be allowed to happen so it must quickly sink into the abyss of the ocean never to be seen again. Coincidentally, Yahoo News published a report on January 2, 2015, entitled “Are Ocean Asteroid Impacts Really a Serious Threat?” According to the report, “If a space rock were to hit the Earth at just the right location in the oceans, it could cause massive waves that could inundate U.S. coastlines”. Translation, the asteroid would cause tsunamis around the world, killing millions. Lastly, when the European Space Agency (ESA) allegedly landed the Philae spacecraft on the 67P/Churyumov–Gerasimenko comet on November 12, 2014, it was a publicity stunt designed to program the masses for the impending asteroid attack as depicted in the Truther.org report entitled “10 Reasons Why the Rosetta Comet Landing was a Hoax”. Prior to a high-profile man-made asteroid attack just prior to or shortly after the fruition of JADE HELM 15 on September 15, 2015, the world must be psychologically prepared to accept that this is in fact possible. Fraudulent headlines and fabricated events are a slick way of convincing people that yes, it can happen. As evidenced, JADE HELM-related asteroid strike terror propaganda is now at an all-time high which suggests that a man-made asteroid attack during the unprecedented military exercise is imminent. The notion that an asteroid strike is planned for September 2015 was first identified back on February 4, 2015, in an Inquisitor report entitled “Asteroid Impact Apocalypse 2015: Mass Anxiety as Conspiracy Theorist Predict Catastrophe” The propaganda report revealed that the “U.S. government has information about an impending asteroid impact catastrophe, but is keeping the information secret to prevent mass panic, is spreading fast and causing growing anxiety among doomsday believers”. The report also stated that “there is increasing convergence of opinion among believers that an asteroid apocalypse will occur in September, 2015” and that “the growing mass hysteria appears to have originated with a self-proclaimed prophet, Reverend Efrain Rodriguez, who claimed he sent a letter to NASA on November 12, 2010, entitled “Letter to the Space Agency…Meteor Heading toward Puerto Rico”. In the letter, Rodriguez claimed he had received a message from God that an asteroid that would “soon be seen in the alarm systems of NASA” was approaching Earth. Rodriguez predicted that the asteroid would hit the ocean near Puerto Rico and cause a massive earthquake and tsunami that would devastate the East Coat of the U.S., Mexico, Central, and South America. Low and behold, roughly 3-months later on May 1, 2015, it was reported that a 2.5 mile-wide asteroid is now heading to Earth. Roughly a month later on June 8, 2015, the Express published a report entitled “‘US Military Secretly Preparing for Asteroid that will Wipe out Mankind in September‘” which revealed that a “gigantic asteroid will smash into the earth this September, causing mankind to die out in a dinosaur-style mass extinction, conspiracy theorists are warning”. The report also states that JADE HELM 15 is “preparation for predicted anarchy that could ensue as the asteroid nears the planet”. 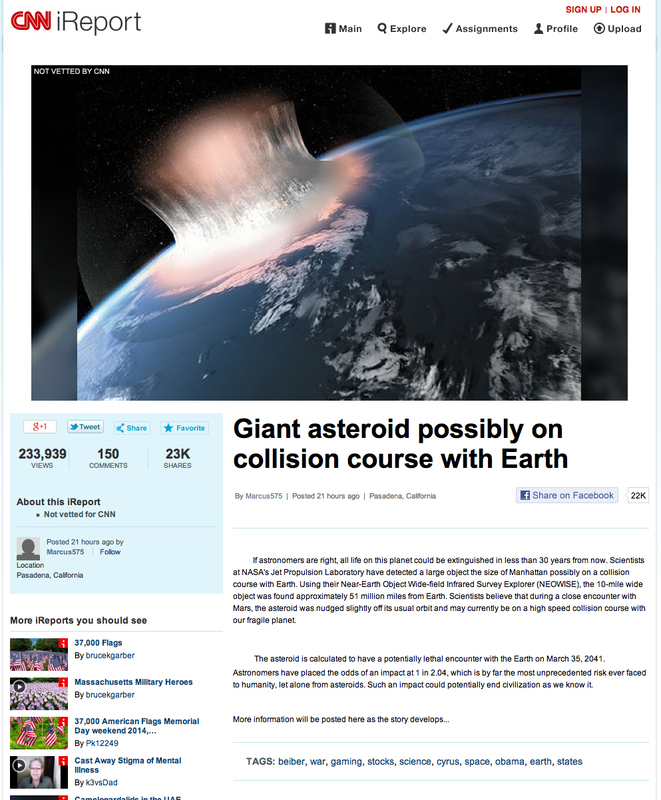 That same day, June 8, 2015, the Mirror published a report entitled “America ‘Preparing for Asteroid Impact with Massive Army Training Exercise to Stop Apocalypse Riots‘” which revealed that “Conspiracy theorists are claiming a controversial U.S. military exercise is in fact preparation for an asteroid that could wipe out mankind” and that “Armageddon conspiracists are linking Jade Helm to their predictions of a huge asteroid hitting Earth this September”. Interestingly, also on June 8, 2015, NASA released a statement to reassure the masses that no large object is expected to hit the planet for “several hundred years”. A NASA spokesman stated that “NASA knows of no asteroid or comet currently on a collision course with Earth, so the probability of a major collision is quite small”. The fact that NASA addressed the rumors and left a “small” window for the possibility of an asteroid strike in September gives the entire JADE HELM 15 asteroid strike narrative credence. Roughly 2-months later on August 6, 2015, the Huffington Post published a report entitled “Asteroid Apocalypse Spells End Of The World In September 2015” which revealed that a “gargantuan asteroid is hurtling towards Earth, with enough power to wipe out life as we know it” and that “our collective demise will occur between September 22-28, 2015”. 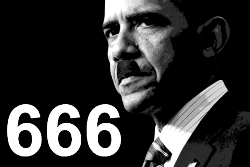 That same day, August 6, 2015, the Huffington Post published another report entitled “Conspiracy Theorists Claim Massive ‘Jade Helm’ Military Exercise Is Preparation For The Apocalypse”, which revealed that a group of biblical theorists believe that a giant asteroid is going to end the world in September and that JADE HELM 15 is preparation by the U.S. government the asteroid strike. Needless to say, these reports, taken collectively, confirm that the CIA and their minions at NASA are plotting a man-made asteroid strike in September 2015, most likely within a JADE HELM 15 held state. Aside from the plethora of space rock attack propaganda which has been disseminated by the government and media, CNN reported on May 27, 2014 that a giant asteroid is possibly on a collision course with Earth. The report was uploaded onto CNN’s iReport in order to further acclimate the public for the impending man-made asteroid attack. After CNN’s asteroid story went viral on the internet, television and social media, NASA confirmed on May 28, 2014, that an asteroid is not on a collision course with Earth. By working in tandem, CNN and NASA were effectively able to spread the false notion of an asteroid attack globally. This was done by first claiming that that an asteroid attack was imminent, only to renege by stating it was a hoax. In order to draw unprecedented media publicity to asteroids just prior to a man-made asteroid attack which kills millions, it was reported back on June 14, 2015, that the comet lander known as Philae awoke from its hibernation. In what appears to be more pre-man-made asteroid attack propaganda, the Huffington Post published a report back on July 4, 2015, entitled “Video Shows What The Night Sky Would Look Like If You Could See Every Asteroid”, selling the notion of a universe filled with potentially threatening asteroids. A day later on July 5, 2015, USA Today published a report entitled “Researchers Plan for Global Armageddon Asteroid Threat”, confirming, albeit in a de facto manner that an Armageddon-like asteroid attack is still in play. Roughly 2-months later on September 11, 2015, the Huffington Post published a report entitled “Earth-Destroying Comet Heading To Earth In 20 Years” which revealed that a highly advanced civilization was wiped out by a comet 12,800 years ago. When the asteroid finally hits Earth, it would be “a thousand times worse than the detonation of every nuclear weapon“. Reports in respect to asteroids, comets, fireballs, meteors, meteorites and streaking lights are currently at an all-time high. This phenomenon commenced on November 28, 2013, just prior to the slated arrival of the man-made comet ISON on December 10, 2013. This sudden influx of space rocks confirms that there is a concerted agenda to develop a believable asteroid narrative prior to an unprecedented and earth changing Doomsday asteroid-like attack. In order to gain plausible deniability in the aftermath of Doomsday asteroid, comet or meteoroid strike, NASA has created a media narrative whereby they will be “taken by surprise” when an alleged space rock suddenly appears out of the east, directly in the Sun’s glare. This is likely why reports on ISON were so ambiguous since ISON’s all alleged trip around the sun. An indication of exactly how this particular scenario would play out occurred on March 7, 2013, when it was reported that an asteroid the size of a city block would pass Earth that weekend. According to the report, “The asteroid was only discovered Sunday because search telescopes can’t find objects of that size until they get close.” Wikipedia further stated that the “2013 ET is a Near-Earth asteroid that was discovered on March 3, 2013, six days before its closest approach to Earth”. If and when the Doomsday asteroid, comet or meteoroid hoax is finally triggered, the world will likely have only a few days to panic prior to its alleged impact. A few weeks later on March 21, 2013, it was revealed that White House science adviser John Holdren reportedly wanted to put “an infrared telescope in a Venus-like orbit to spot asteroids that can’t be seen from the ground because they’re lost in the Sun’s glare” and that “the Chelyabinsk meteorite was exactly that kind of meteor, which came in from a direction that Earthbound telescopes can’t look in.” Bolden then stated, “If [the asteroid] is coming in three weeks…pray”. The January 10, 2013 propaganda report by Forbes entitled, “We Probably Wouldn’t Even See A Doomsday Asteroid Until It Was Too Late” indicates that the sneak attack by a wayward asteroid, comet or meteoroid is in fact part of the working Doomsday space terror script. The notion of a rogue asteroid was recently highlighted in a January 19, 2014 report entitled, “NASA says Mars Mystery Rock ‘Appeared’ from Nowhere”. Eleven days later on January 31, 2014, Christian Science Monitor published a report entitled, “Going Rogue could be the Norm for Asteroids, say Astronomers”. Although these reports were not directly made in respect to asteroids per se, they do confirm that a “surprise” asteroid attack is in play. If and when a Doomsday asteroid strikes Earth, government agencies like NASA will need plausible deniability to excuse their gross maleficence. Coincidentally, on September 10, 2013, it was reported that NASA conveniently lost contact with the comet-hunting Deep Impact spacecraft sometime between August 11 and August 14, 2013. This news was confirmed yet again 11 days later on September 21, 2013, when it was reported that NASA had officially closed the books on the most-traveled comet-hunter in history due to a “software bug” which subsequently cut off communication with the 9-year old spacecraft. The timely loss of the world’s greatest comet hunter suggests that the space attack depicted in “Deep Impact” (1998), a film (see trailer) about an apocalyptic asteroid strike on Earth, is now imminent. As of August 14, 2013, NASA is conveniently and officially blind to incoming Earth threatening asteroids, comets or meteoroids. In order to pretend that there is a real asteroid problem and that they are actively trying to thwart an impending asteroid attack, a number of propaganda reports have been disseminated in order to give governments and their respective space programs the excuses they will need in the aftermath of an asteroid attack that kills millions. In what appears to have been a beta-test for an impending Doomsdays asteroid, comet, o meteoroid strike, on February 15, 2013, a small asteroid struck in Chelyabinsk, Russia, allegedly injuring 1,500 people. This suspicious event was made even stranger because it happened on the same day that the asteroid known as “2012 DA14” flew by within 17,200 miles of Earth. According to Wikipedia, the Chelyabinsk asteroid was the largest known object to have entered Earth’s atmosphere since the 1908 Tunguska event, and it’s the only asteroid to date which has caused a large number of injuries. The “Chelyabinsk” event appears to have been nothing more than a staged beta-test to assess the hoax-ability of a future Doomsday asteroid, comet or meteoroid. Although this alleged asteroid strike was completely unexpected, there were numerous video cameras shooting its entry from almost every conceivable angle (all of which were recovered, downloaded, uploaded, edited, produced, uploaded again and broadcast within minutes of the event on February 15, 2013). The fake asteroid also appeared to burn out prior to ever hitting the ground, making the hoax even easier to pull off. 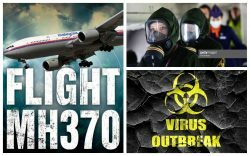 A year later on February 15, 2013, it was reported that “conspiracy theorists” have claimed that the Russian meteorite was shot down by a military missile. Like most intelligence reports, the information was presented backwards. The reality is that the Chelyabinsk Asteroid was most likely a missile itself, albeit a doctored one designed to look like a meteorite. In order to rehash the Russian meteorite narrative just prior to an impending asteroid strike, it was reported on November 19, 2013, that a new meteor has once again struck Russia. Aside from the question posed in the headline “Where Exactly Did The Russian Meteor Come From?”, there are other pressing questions in respect to Chelyabinsk asteroid of February 15, 2013, that demand answers. What are the chances of 2 major astrological events occurring on the same day? Where these 2 astrological events related to each other? In a February 19, 2013, CNN report entitled “A Meteor And Asteroid: 1 In 100 Million Odds”, the notion that the two events were related was openly dismissed: “…the time between the two events, the Earth moved roughly 300,000 miles, meaning the asteroid and the meteor were in completely different places. So there is no way the meteor and the asteroid are connected. It has to be a coincidence that the two events happened on the same day….the chance of both events happening on any one day are indeed very small…about 1 in 100 million”. As luck would have it, the alleged manifestation of these two mathematically impossible asteroids just happened to coincide with hundreds of propaganda articles warning Earth of an impending asteroid strike. Hollywood movies blockbusters such as “Armageddon” (1998) (see trailer) and “Deep Impact” (1998) (see trailer) were made with the sole purpose of psychologically preparing humanity for the notion that an asteroid could in fact strike Earth and that its aftermath would be apocalyptic in nature. Although there will likely be plenty of video footage of a Doomsday asteroid, comet or meteoroid striking Earth (people have to see it to believe it), the asteroid will quickly and conveniently disappear beneath the Pacific Ocean, never to be seen again. After all, a Doomsday asteroid will never strike land because there it can be located, examined and tested for its authenticity; that obviously cannot be allowed to happen. 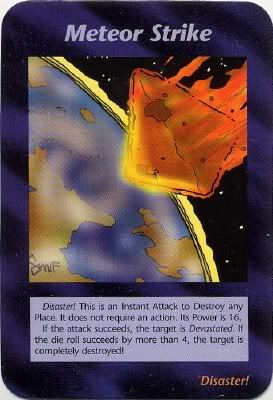 The notion of a man-made asteroid or meteor attack was ominously depicted in the “Meteor Strike” card of the Illuminati Card Game (1995). The game was created in order to program the conspiracy minded for upcoming events (e.g., 9/11) as well as to discount their man-made nature in the aftermath. Prior to a high-profile man-made asteroid attack, the world must be psychologically prepared to accept that this is in fact possible. Fraudulent headlines and fabricated events are a slick way of convincing people that yes, it can happen. As evidenced, space rock-related terror is now at an all-time high which suggests that a man-made asteroid attack is imminent. 20. March 23, 2015: Asteroid: How Long Will Survive on Planet Earth? Just as asteroid rhetoric and propaganda is reaching an all-time high, the mysterious space program entitled “SpaceX” is working overtime. On May 25, 2012, SpaceX made history as the world’s first privately held company to send a spacecraft to the International Space Station (ISS). Curiously, almost everything SpaceX does, it does wrong, or at least that’s the way the alleged space transport company would like to be publicly perceived. Starting with its launch reported on October 8, 2012, SpaceX was allegedly sent into the wrong orbit because of a booster problem during launch. Four days later on October 12, 2012, the communications satellite flying piggyback aboard a SpaceX’s Falcon 9 rocket allegedly fell out of orbit and burned up in the atmosphere following another problem during liftoff. Five months later on March 1, 2013, it was reported that SpaceX, allegedly on route to the ISS, ran into thruster trouble shortly after liftoff and consequently missed its docking date with the ISS. These are rocket scientists, not armatures. 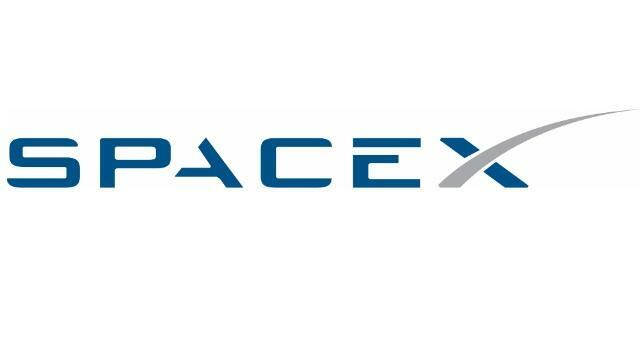 A truly private company could never afford to do business in such an unprofessional manner further raising suspicions that there is more than meets the eye in respect to SpaceX. On March 21, 2013, it was reported that SpaceX’s “Dragon” supply spacecraft was set to leave the ISS and return to Earth while three new crew members are scheduled to arrive at the ISS shortly. Whatever is going on up there with SpaceX and the ISS is still unknown, but it is anything but kosher. Although only time will tell, it appears that SpaceX may be the private space program set-up to attack Earth with a man-made Doomsday asteroid. The fuel cells needed for a man-made asteroid appear to be SpaceX’s Grasshopper VTVL Rockets which have been launched at least 5 times in 2013 in so-called tests. However, since SpaceX has a private launch site in McGregor, Texas, there is no way to confirm just how many Space X-related rockets have been launched into space. While most rockets are designed to burn up in the atmosphere during reentry, SpaceX’s Grasshopper rockets are designed to return intact to the launch pad for a vertical landing so it can be reused for future launches, possibly involving man-made asteroids. According to SpaceX themselves, “Grasshopper … continues SpaceX’s work toward one of its key goals—developing fully and rapidly reusable rockets, a feat that will transform space exploration by radically reducing its cost”. Although the true mission of the Grasshopper program is not public, in the event that a massive man-made asteroid, comet, or meteoroid-like structure was being constructed in space just above the Earth, reusable fuel cells would be needed to project the given object back into the Earth’s atmosphere in a slow, fiery and believable fashion. The command and control exerted over the Grasshopper rockets is quite extraordinary as they can launch and land upright in the exact same fashion. As witnessed on August 14, 2013, when a SpaceX’s Grasshopper test rocket successfully flew sideways, the Grasshopper is essentially a massive remote-controlled rocket that can be directed any which way. This type of fluidity and control would definitely be needed in order to guide a fake Doomsday asteroid or comet across the sky and into the ocean in a manner which does not draw any suspicion by the billions watching around the world with baited breath. As witnessed on November 18, 2013, when NASA’s Atlas V rocket was loaded with 50,000 gallons of liquid oxygen and launched into space, the fuel within this rocket and that of the 10 or so rockets which have launched thus far in 2013 could be used to fuel the man-made Doomsday asteroid. One in space, the rocket fuel could theoretically be transferred and stored in a secondary location such as International Space Station (ISS) for future use. Once the Doomsday asteroid mission was given the official green light, the fuel could then be injected into the 50 or so Grasshopper-like rockets that will likely make up the Doomsday comet. Coincidentally, the Grasshopper VTVL vehicle uses many of the same rocket parts that SpaceX employs for its official spaceflight missions with NASA and the ISS, making the likelihood of collusion on a undercover project such as a man-made asteroid all the more feasible. In a telling sign that a “Deep Impact” strike in the Pacific Rim of Fire is upon us, the official video released by SpaceX of a Grasshopper launch was accompanied by Johnny Cash’s “Ring of Fire”. The easiest way to tell if an asteroid is fake is by looking at its vapor trail (or lack thereof) . Because real asteroids are driven by gravity, they has no exhaust or vapor trail. However, in order to program scientists for a fire breathing asteroid, it was reported on January 22, 2014, that the Ceres asteroid vents a water vapor, a laughable notion to be sure. This pseudo-science report was quickly followed by another on March 26, 2014, which stated that astronomers found the first asteroid with rings. Aside from the fact that these finding go against everything known about asteroids, they have been disseminated because a man-made asteroid attack will produce a noticeable exhaust trail. This is because a man-made asteroid is in essence many rockets which have been molded together to look like an asteroid.